Each month during the off-season, the Charleston RiverDogs close the office to complete one day of volunteer service with a local nonprofit organization. On October 22, ten members of the Charleston RiverDogs front office staff spent the day volunteering with Charleston Habitat for Humanity. The team met Friday morning to assist with the ongoing restoration and renovation of the home of Beatrice Dennis. Since acquiring the the property, Dennis’ home has developed serious structural problems,including crumbling supports and rotting wood, which have led to a serious Eastward lean. If it were not for a new partnership between the Historic Charleston Foundation, Habitat for Humanity, and the City of Charleston, Dennis may have been forced to continue living in a deteriorating home or move elsewhere, but fortunately that is not the case. The three organizations have combined forces to renovate the house for Dennis and her family along with the help of community volunteers, including the Charleston RiverDogs staff. The Historic Charleston Foundation is helping to preserve the home’s exterior, but the inside of the home, however, will resemble a new Habitat home. The Foundation supported the interior renovation to ensure that Dennis and her family would be able to afford to stay there. “Knowing that this is not just a house, but rather the home of a real family in our community makes this project so special. I am thankful for the opportunity to lend a hand to Beatrice and her family, and I hope that they have many years of happy memories to come, in this home” stated Sarah Ward, RiverDogs Director of Community Relations. Habitat and the Foundation are seeking other homes that owner-occupied and somewhat historic to help this way. Charleston Habitat for Humanity is a locally run affiliate of Habitat for Humanity International, a nonprofit housing organization. The organization provides affordable home ownership opportunities, whether it be new home construction or home repair, for working families of moderate income in Charleston and North Charleston. 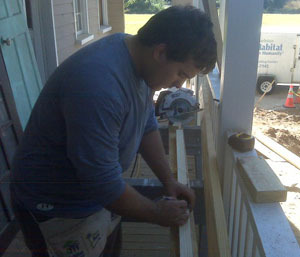 For more information, to donate, or to volunteer please visit www.charlestonhabitat.org. The Kids with Cancer radio-thon is an annual volunteer event for the Fort Myers Miracle. This year on October 15th the Miracle staff answered phones to take donations for the local Children’s Hospital. This year the community donated $147,000 for Barbara’s Friends and their fight against children’s cancer at the Children’s Hospital of Southwest Florida. Barbara’s Friends serves as the Children’s Hospital Cancer Fund for The Children’s Hospital of Southwest Florida. Their Pediatric Hematology and Oncology Outpatient Center has helped over 3,000 children who have been diagnosed since they’ve opened. Most the families of the children being treated are without insurance, but are never turned away. This annual Radio-thon is the biggest fundraiser of the year for Barbara’s Friends with all proceeds going to fund programs, equipment and the children’s medical care. 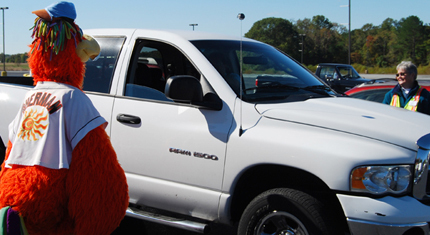 For a fifth consecutive year, the Delmarva Shorebirds and Peninsula Regional Medical Center partnered to put on a “Drive-Thru” Flu Clinic in the parking lot of Arthur W. Perdue Stadium. PRMC administered vaccinations on Thursday, October 21 and Friday, October 22 from 10 am until 6 pm. This year, the two-day clinic administered approximately 5,000 vaccinations according to PRMC Director of Community Relations, Roger Follebout, Jr.
Peninsula Regional Medical Center has effectively used the “Drive-Thru” model for the last 17 years. The clinic was previously run at the hospital until PRMC went in search of a bigger venue. Including nurses, hospital administrators and volunteers, between 75-100 people assisted in the overall operation of the clinic. If you missed the clinic and are in need of more information about vaccinations, please contact Peninsula Regional Medical Center at 1-800-955-PRMC or visit them online at www.peninsula.org. 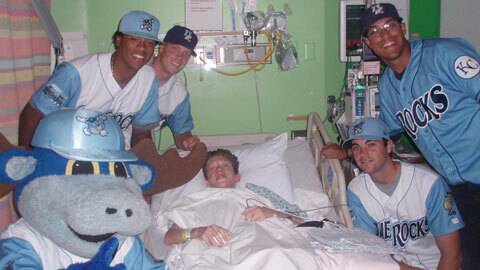 The Wilmington Blue Rocks continued their commitment of giving back to the community throughout the 2010 season. The year saw the team, in tandem with its marketing partners and fans, raise $744,721.99 worth of contributions to local charities, schools and community organizations. The sum includes many different types of contributions including cash, tickets and services. The Wilmington Blue Rocks were able to donate $19,115 to local organizations in 2010. These donations included Little League sponsorships, specialty game-worn memorabilia auctions, ticket kickbacks, and a sponsorship with the Boys and Girls Clubs of Delaware. Other organizations that benefited from this included: The Ronnie Williams Foundation, the ING DIRECT Kids Foundation, United Cerebral Palsy of Delaware, and the Kelly Heinz-Grundner Brain Tumor Foundation. Each year, the Blue Rocks are able to accommodate almost every donation request. Through those donation requests, school programs, and by offering bulk tickets to select local organizations (Kind to Kids, USO Delaware, Delaware Police Departments, and more), the Blue Rocks were able to donate almost 67,000 tickets for the 2010 season. During the 2010 season, local organizations had the opportunity to work the concession stands during Blue Rocks games. In exchange, Centerplate, the concessionaire for the Wilmington Blue Rocks, gave them a portion of the revenue from that game. Throughout the season, over $63,000 was donated to these organizations for their efforts. During home games, the Blue Rocks allowed select non-profits to promote themselves or upcoming events. This promotion was executed through the use of the RocksVision video board, the public address system, and by providing concourse tables. 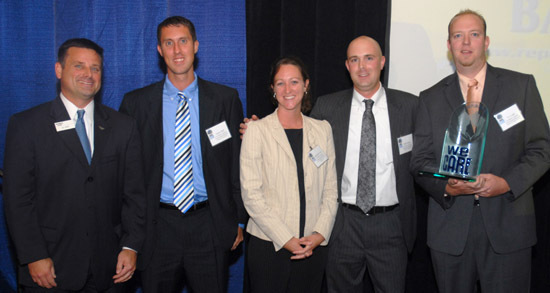 The Blue Rocks Front Office donated over 50 hours of their time to speak at community events. These events included speaking to children at local elementary schools, high schools, and colleges about careers in sports, and speaking to local organizations about the Blue Rocks. Wilmington Blue Rocks Players made many appearances over the 2010 season. Some of these appearances included visiting the Nemours/Alfred I. duPont Hospital for Children (at least once a month), a youth detention center, local schools, United Cerebral Palsy’s summer camp, as well as other local summer camps. Rocky Bluewinkle visited 196 community events this year. (Spanned over 240 hours; Value of free or discounted appearances – $7,500). The Blue Rocks opened up Frawley Stadium to select charitable organizations during home games, and enabled them to raise money for their respective causes. Money was raised by selling t-shirts, raffle tickets, and by collecting donations. There have also been a number of check presentations before Blue Rocks games during the 2010 season. K’s for Kids: Blue Cross Blue Shield of Delaware donated money every time a Blue Rocks pitcher recorded a strikeout at home. At the end of the season, Delaware Guidance Services for Children and Youth, Inc. was presented with a $5,000 check. Stolen Base Learning Initiative: SBLI Life Insurance donated money for each Blue Rocks stolen base during a home game. At the end of the season, BooksFirst! was presented with a $5,000 check. Stolen Bases for Happy Faces: New Castle County Chamber of Commerce donated $5,000 to the Bear Babe Ruth Baseball League Miracle League Field project. B+ Score for the Cure: AstraZeneca donated money for each Blue Rocks run scored at home. At the end of the season, the B+ Foundation was presented with a $5,000 check. Make-A-Wish Night: On Aug. 31, the Blue Rocks hosted Make-A-Wish Night. Wish Kids were treated like stars. They were able to participate in some unique activities before and during the game, and they received lots of autographs and free stuff. Challenger Little League: The Blue Rocks continued the tradition of working with the Challenger Little League to host its season’s Opening Ceremonies. Each player was introduced individually, and all teams get to play on Judy Johnson Field. Stadium Tours: The Blue Rocks offer stadium tours for free. Tours are usually 30 minutes long. In 2010, the Blue Rocks hosted 60 tours, many to community organizations with little to no funding. Toy Drive: The Blue Rocks were once again, able to contribute toys to the Mary Campbell Center. Rocky Claus surprised guests at the Mary Campbell Center’s youth and children holiday party with a sack full of donated toys. The Wilmington Blue Rocks are committed to tackling the epidemic of childhood obesity. To do so, the Blue Rocks have partnered with local programs like Nemours Health and Prevention Services, Titus Sports Academy (CHAMPIONS program), and Girls on the Run. Through these partnerships the Blue Rocks have been able to reward kids who participate in health/fitness-related extracurricular activities. The Lexington Legends have won a 2010 Republic Bank We CARE Award for outstanding community service. The We CARE (Community Activity Recognition Enterprise) awards give recognition and appreciation to local companies whose employees are actively involved in a variety of community service activities. The program was launched in 2006, and the Legends have been nominated for awards in each of the last three years. Winners were announced Thursday night in a ceremony at the Griffin Gate Marriott. WLEX-TV news anchor Kevin Christopher served as master of ceremonies. More than 50 nominations from organizations in seven categories met the We CARE criteria and were accepted for the awards competition. Organizations were judged on how they encourage employees to become involved in volunteer activities either during or after business hours. They were also evaluated on how they support community-based initiatives through philanthropic efforts and neighborhood assistance. Winners were selected by an independent panel of judges consisting of previous winners and community leaders. 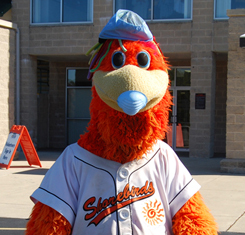 The Legends, a class A minor league baseball affiliate of the Houston Astros, won in the category of entertainment and leisure. The Legends have provided in-kind donations of tickets, memorabilia and suites to more than 250 non-profit organizations in 2010. Legends employees participate in many fund-raising events, including the Polar Bear Plunge, Bowl for Kids Sake, the Diabetes Walk and others. Employees also participate in Habitat for Humanity, Big Brothers Big Sisters, and Junior Achievement. “The Republic Bank We CARE Awards have again brought to light the quality and variety of volunteer work done by so many companies in our community,” said Bo Henry, Market President of Republic Bank. “All of us at Republic Bank recognize the employees of the nominated companies, and the winning companies, for the community efforts they put forth that contribute so much to making this such a great place to live and raise our families,” stated Steve Trager, Chairman and CEO of Republic Bank. Winning companies received a handmade glass sculpture award designed by Ken von Roenn of Kentucky’s Architectural Glass Art, and WLEX-TV will produce and broadcast video vignettes highlighting each winning company. (Left to Right) Bo Henry, Market President of Republic Bank with Legends Staff, Justin Ball, Stephanie Fish, Seth Poteat, Ty Cobb. 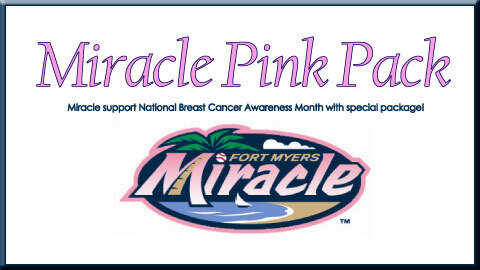 Click here to get the details about the Miracle’s special “Pink Pack” of tickets for 2011, with $15 from each pack sold being donated to Partners For Breast Cancer Care. Act soon as the offer is good through the end of October! Charlie T. RiverDog, the loveable mascot of the Charleston RiverDogs, participated in a 24-hour running and walking fundraiser for a memorial wall to honor 49 South Carolina Highway patrolmen killed in the line of duty that has raised more money than expected. The Fallen Troopers Memorial Run, a 24-hour, 100-mile run/walk at Charleston Southern University held Oct. 5-6, raised more than $30,000, according to Lance Cpl. Bob Beres, the trooper who spearheaded the effort. The initial goal was $20,000. The addition money will go toward maintenance and upkeep, possible lighting and landscaping, Beres said. A granite memorial wall bearing the troopers’ names will be erected at the S.C. Highway Patrol’s headquarters in Blythewood. At least three of the names on the wall will be of local patrolmen: Cpl. Richard Varn Woods, Trooper First Class Bruce Smalls and Lance Cpl. Mark Coates. All three were killed in the line of duty by drivers of vehicles they had pulled over. Gwinnett County’s public safety agencies want residents to know what they do to keep the community safe. The Gwinnett County Police Department and Gwinnett County Fire and Emergency Services joined together Saturday for the first Public Safety Fall Festival at Coolray Field, the home of the Gwinnett Braves. The event featured dozens of displays and demonstrations from the police and fire departments, including specialized units like SWAT, Ground Search and Rescue, HazMat and Swift Water Rescue. Several other governmental and nonprofit agencies were also on hand to provide safety information. Richter said the festival provided a stress-free, fun-filled environment for the community to interact with public safety officials. 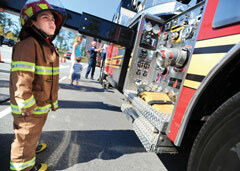 Saturday’s event also served as a kickoff for National Fire Prevention Week and Fire Prevention Month in Gwinnett County, said Capt. Thomas Rutledge, spokesman for the Gwinnett County Fire Department. Buford resident Kim Arakas and her family came to the festival to see the police and fire vehicles and learn about public safety. Haydee Nunez, who lives in Lawrenceville, brought her children and her nephew to the event because they are in Cub Scouts. The Gwinnett Braves announced today that the Cody Fund, at the Community Foundation of Northeast Georgia, is the recipient of the Gwinnett Braves October grant. The $1,000 grant will be used to purchase a new Police K-9 for the Snellville Police Department. The Gwinnett County K-9 Unit has six police canine teams that provide support to the Uniform and Criminal Investigations Divisions. Their primary duties include tracking lost or missing persons, tracking wanted persons, finding evidence or lost property, conducting building searches, serving high risk warrants and locating illegal narcotics. In addition the unit also has a K-9 Team trained to detect explosive materials and provides support to the department’s EOD Unit. The Cody Fund was created to support police K-9 units in Gwinnett County. Kathy Gestar, an avid dog lover, attended the Snellville Police Academy in 1999 and was impressed by the service that officers and their K-9’s provide to protect Gwinnett residents. Moved by the need for additional dogs and equipment, Gestar founded the Cody Fund, named after her beloved Sheltie that passed away in 2008. Since its inception in 1999, the Cody Found has awarded grants for the purchase and training of K-9 dogs, as well as for their specialized medical care and K-9 unit equipment.